On Wednesday, trading on the euro/dollar pair closed slightly up (+9 pips). The price spent the whole day within a range of 1.1903 to 1.1950, staying within the 1st of September’s range of 1.1850 to 1.1980. The euro rose to 1.1950 during the European session. From there, the price went back down to 1.1914. There was a jump in volatility during the US session after the Bank of Canada announced its decision to raise its key rate by 25 base points to 1.00%. The US dollar collapsed against its Canadian counterpart, shedding 279 pips to reach 1.2136. The publication of US data didn’t bring any respite. The ISM non-manufacturing index came out lower than expected. 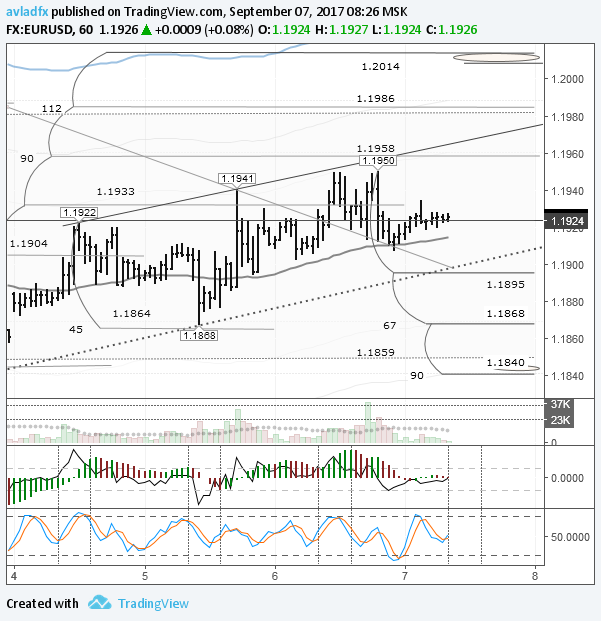 Trader activity on the EURUSD pair was low in anticipation of the ECB meeting and Mario Draghi’s press conference. 09:00 Germany: industrial production (Jul). 10:00 Switzerland: foreign currency reserves (Jul). 10:30 UK: Halifax house prices (Aug). 15:30 Canada: building permits (Jun). 15:30 USA: initial jobless claims (1 Sep), nonfarm productivity (Q2), unit labour costs (Q2). 17:00 Canada: Ivey PMI (Aug). 18:00 USA: EIA crude oil stocks change (28 Aug). On Wednesday, our pair traded within a 47-pip corridor. After an unsuccessful attempt at breaking 1.1950, buyers retreated to the LB balance line. Now, markets are awaiting the results of the ECB meeting and Mario Draghi’s press conference to follow. I won’t be making a forecast in today’s review. It’s rather pointless to do so when the head of the ECB is set to give a press conference. He could easily cause a storm on currency markets today. Market participants are interested to know what he’ll say about the strength of the euro, and whether he will announce a date for the reversal of the ECB’s QE program. During Draghi’s speech, I’m expecting to see a price range of 1.1840 – 1.2014. There’s a resistance at 1.1965 and a support at 1.1900 (trend line).